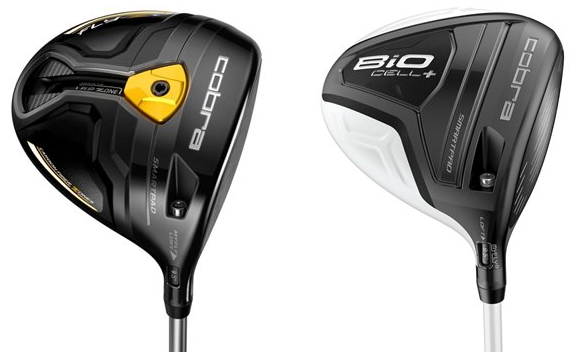 Building off the success of the BiO Cell + Driver, Cobra Golf continues to make tremendous technological advancements within their driver category. The Cobra Fly-Z+ driver features a weight technology called FlipZone which is the first adjustable front & back center of gravity (CG) weighting system ever manufactured. With the placement of a movable weight on the sole of the club, you can change your ball flight by moving this weight vertically along the sole of the club. A forward setting will produce a penetrating ball flight with more roll, conversely a back setting will produce a more towering ball flight with more carry. Unlike the Cobra BiO Cell + driver which featured a Matrix Red Tie stock shaft and upgraded Diamana and Project X shafts, the FLY-Z+ driver will offer a Matrix VLCT ST shaft as the stock option as well as the Aldila Tour Blue, Aldila Tour Green, and Matrix White Tie shafts at no upcharge. These four options provide a broad range of choices for players of all abilities and swing types. Although very similar to the BiO Cell + driver, the FLY-Z+ driver features a more traditional design available in a solid black, blue, orange, white, and a limited edition green club head. The stock grip is the Lamkin Ace 3Gen that’s available in five colors. However, many other custom options are available. Exclusive to Cobra, this engineered trench surrounds the face to help minimize face thickness providing increased ball speeds across the face for increased distance. Cobra’s E9 forged face removes weight from key areas across the face and hosel to increase the size and speed of the sweet spot for more distance on off-center hits. Removes weight from the crown to help re-position it low and back in the head for a low, deep CG to deliver extreme forgiveness on off-center hits. Thin, Optimized, Personalized. Cobra made some advances in this area with a new Titanium 6-4 body and carbon fiber crown and sole pieces to maximize discretionary, movable weight. This allowed Cobra to position weight for maximum distance and forgiveness. Like the BiO Cell +, the Fly-Z+ driver will have eight easily adjustable loft settings (8.5, 9.0, 9.0 Draw, 10.0, 10.0 Draw, 11.0, 11.0 Draw, and 11.5). At 460cc the FLY-Z+ will be larger than then its predecessor which measured in at 440cc. One additional advantage that Cobra has over its competitors is that with this technology players can change their lofts without affecting the face angle. It’s not often that you see game changing technology introduced to the market but Cobra has certainly done so with their FlipZone technology. As technology continues to improve and custom fitting becomes more prevalent, players of all abilities should be able to have a club in their hands that is optimized for the best launch, spin rate, and overall performance that can be achieved. With great looks and performance you’ll certainly want to boost your game with the Cobra FLY-Z+ driver! Kevin has been a Class “A” member of the PGA of America since 2009 and graduated from the University of Miami with a degree in Business Administration. He has 7 years of experience at two of South Florida’s most prestigious clubs, Coral Ridge Country Club and the Broken Sound Club. Prior to Global Golf, Kevin was the Lead Professional at the Hasentree Club in Wake Forest, North Carolina for 4 seasons. Kevin has an extensive knowledge in club fitting along with a tremendous passion for golf course architecture and has traveled extensively throughout the United States and Europe playing many of the world’s top courses.